• Volcano: Enjoy the fresh weather and beautiful landscape. Mt. Batur status is still active,the first documented eruption in 1804 and the last eruption with huge lava in 1974. • Monkey Forest: This area is a monkey habitat and protected by local government. The sacred monkey forest is not only for tourist attraction but good for economic life of local people and for research conservation programs. The visitor can enjoy and take pictures with monkeys and the surrounding atmosphere. • Rice Terrace Field: Subak is an irrigation system for water management which was developed around 9th century. Subak system works without a machine pump. 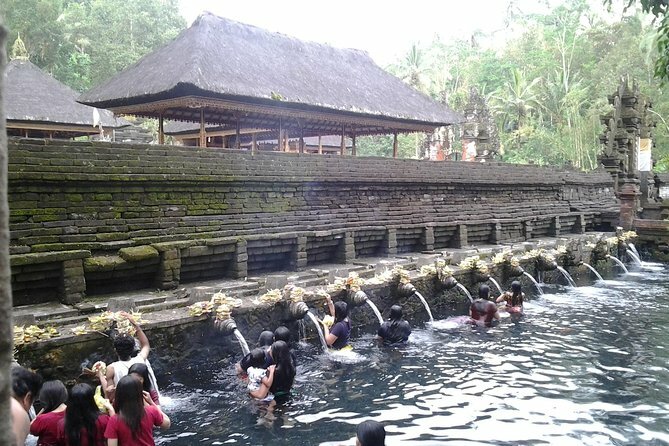 The water is taken from the above mountain and flows downward to irrigate rice fields and also used for construction. • Luwak Animal: Luwak animal is a famous animal and contribute significantly to the production to coffee. • Spa & Treatment: After finished Tour relax with Spa Treatment for 2 hours. You can enjoy type of massage like Traditional Balinese massage and Javanese body scrub. Fantastic tour and great guide we would recommend to anyone. Only thing we didn’t like was the buffet lunch at Mt Batur. Overpriced for the food you got and most of it was cold. It was a long but fantastic day! We saw so many things around the island and our tour guide was super. He had very good English and a great sense of humour along with lots of information about the places we visited. We definitely recommend to anyone who wants to see more of Bali. This was another memorable trip for us and our tour guide was an incredible host. It was a long but an enjoyable day ending with the 2hr Balinese spa treatment. I would recommend this tour to anyone going to Bali. This was a perfect excursion with our teenage sons. We had a wonderful tour guide who was informative and so very sweet. It was a great way to spend the day seeing Bali. We were on the moving seeing as much as posssible and capped the day with a spa treatment. If you want to experience Bali in one day, this is the tour! Our tour guide Edy was wonderful! He was very insightful, funny, and catered the tour to exactly what we wanted. We mentioned we wanted to see the waterfalls in Bali and he added it to our tour! The 2 hour spa treatment was amazing, probably the best massage I've ever had! I absolutely enjoyed this tour for my last day in Bali. Tour guide was very informative about Bali culture, the people and the food in Bali. The tour guide was very attentive of any needs or concerns I has during the tour. The 2-hour massage was the best massage I have received hands down, it was very relaxing for my last day in Bali. Great tour. Our driver and guide Eddy was great and would recommend him to others. Eddy was very knowledgeable and nothing was too much trouble for him. The whole trip was great and enjoyed the spa and massage at the end of the trip. Our driver and guide did a good job explaining all the sites we went too. Just be aware that entrance prices to sites are not included. Great massage!